Even the best boards want to be better. 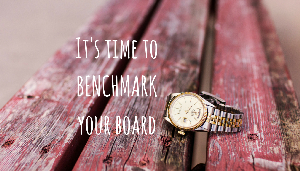 That's why, from time to time, you should benchmark your nonprofit board. Sometimes, just knowing how you compare helps you see where there are opportunities for change…and improvement. A good place to start is by understanding what other boards are doing. Before you begin, you need to understand where you are. You need a baseline. Do you have term limits? If so, how many years can a board member serve per term? Do you have consecutive terms limits? If so, how many terms can a board member serve? How many committees do you have? What types of committees do you have? When was the last time you reviewed and/or revised your Bylaws? Do you have an executive leader succession plan in place? Have you conducted a formal, written board assessment within the past 3 years? Now you've got your baseline. Compare your answers to what other nonprofits are doing. WHAT ARE OTHER NONPROFIT BOARDS DOING? Number of board members. In 2015, nonprofits had an average of 15 board members. This number has been declining over the years. Takeaway: There's no one-size-fits-all when it comes to board size. Bigger boards aren't necessarily better boards. Term limits. More than 7 out of 10 (71%) of nonprofit boards institute term limits. Nearly two-thirds (63%) have 3-year terms. The second most common term limit is 2 years. Takeaway: Term limits are an essential practice that encourage regular board turnover. This allows for new ideas and new energy, so your nonprofit can grow and thrive. Consecutive term limits. 40% of boards limit board members to serving 2 consecutive terms. Another 22% allow board members to serve 3 consecutive terms. Takeaway: The most popular length of board service is 6 consecutive years. The most popular format is two consecutive 3-year terms, followed by three consecutive 2-year terms. Meeting length. Boards with a local scope are more likely to meet for less than 2 hours. Boards with a statewide scope are more likely to meet between 2 and 2.5 hours. Boards with a national scope are more likely to meet between 2 and 4 hours. And boards with an international scope are more likely to meet 8 hours or more. Takeaway (4 and 5): Boards should meet often enough, and long enough, to ensure they are fulfilling their legal and fiduciary responsibilities. Committees. Nonprofits have an average of 4.8 committees. Thirty years ago, nonprofits had an average of 6.6 committees. Committee type. The most common committees are Finance, followed by Executive, then Governance and Development. Takeaway (6 and 7): You've heard the expression, "too many cooks in the kitchen?" A lot of nonprofits have too many committees in the board room. Subcommittees (like event committees) can roll up to a standing committee (like Development). This allows the board to remain focused on high-level, strategic issues at board meetings instead of listening to endless committee reports. Bylaws. 85% of nonprofit boards have reviewed their bylaws in the last 5 years, and more than half (57%) have reviewed their bylaws in the last 2 years. Takeaway: Bylaws are a living, breathing document. They should be reviewed regularly and revised as needed. Succession Plan. Only one-third (34%) of nonprofit boards have an executive leader succession plan, yet 50% of boards will replace a CEO or Executive Director in the next 5 years. Takeaway: Executive succession planning needs to be a priority for all nonprofits. Even long-time executives will retire one day. Some leaders will take new jobs. Others may have medical emergencies or even die. Will you be prepared when the time comes? Board Assessment. 29% of boards have never done a formal, written board assessment whereas more than half (52%) have done an assessment within the past 3 years. BoardSource recommends a comprehensive self-assessment every 2 years. Takeaway: CEOs and Executive Directors report higher performing boards, better board orientation, and greater board engagement when the board does a regular self-assessment. This data comes from BoardSource, a respected authority and the national leader on nonprofit board governance and leadership. Every two years, they conduct a national study on nonprofit board practices. With more than a dozen years worth of data, BoardSource offers trends and insights to what's really happening inside nonprofit boardrooms. How does it compare with what's happening in yours? What are we currently doing, and why? Are there things we should consider doing differently, and why? What new policies or practices should we adopt, and why? And when? Don't forget to answer the "why" questions. And make sure you follow through on "when." Hold yourself, and your fellow board members, accountable for making change happen. Every board is different because every nonprofit is different. And sometimes, just knowing what other boards are doing (or aren't doing) can help you improve your own performance. The good news: You CAN build a better, stronger, high-performing board and organization. And whenever you need help, I'm here. Contact me when you're ready, and let's talk about how you can take your board and your nonprofit to a new level. Laura Rhodes received a Certificate in Nonprofit Board Education from BoardSource in 2016. She conducts board education and engagement sessions, retreats and trainings for nonprofits across the U.S.